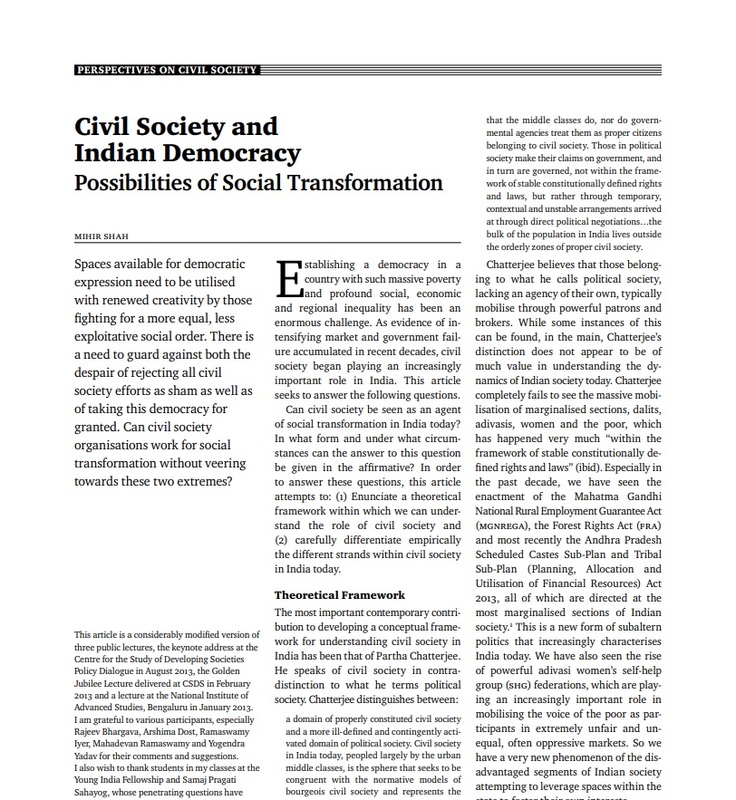 Amidst an intensifying market and a government facing challenges, civil society in India is playing an increasingly important role. The article argues that democratic countries should provide a space for civil society and this space should be utilized by those fighting for a more equal, less exploitive social order. Compassion and charity: This way of organizing comes from the well-springs of compassion and charity. Examples of actions fitting into this category include providing blankets to the homeless in winter and opening kitchens for the hungry. The aim is to reach out and facilitate immediate relief to those in need, but not necessarily addressing long-term causes. Developmental NGOs: This type of organization acknowledges the root causes by recognizing that many issues are a consequence of the ruling market and government. These organizations make an effort to bridge the gap which the market and/or government leaves. Often large NGOs occupy this space. Rights-based activism: These types of organizations take a more critical stand towards the ruling system. This work critiques mainstream practices of government and markets while also generating wider awareness of this critical view. The aim of these organizations is to empower citizens by making them aware of their rights under the Constitution. Engaging the state and leveraging the market: This type of organization believes that change is best fostered by deep engagement with the state in a constructive manner and within time frames that are more sensitive to the needs of the people in whose name this action takes place. The aim is to suitably transform the state, its policies and its functioning in order to play a role. A recommendation for civil society organizations is that they should be a positive source of change by being competent, professional, transparent and (externally) accountable. Policymakers should take into account that building partnerships should be done with mutual respect as well as with humble acknowledgment of stakeholders. This will lead to a more inclusive society as a whole.